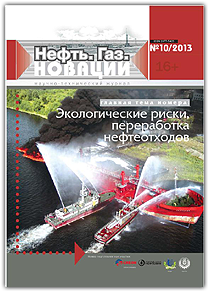 The Russian scientific and technical journal, “Neft. Gaz. Novatsii” (Oil. Gas. Innovations), published the article: “Computer Modeling of Environmental Problems in the Oil and Gas Industry” (#10/2013), prepared by Simmakers Ltd.
Simmakers Ltd representatives I.A. Gishkelyuk, D.V. Evlanov, and V.I. Kovalenko, published the article which analyzes the use of computer simulation methods for solving environmental problems. It also describes the creation of a computer model which forecasts the effusion of petrochemicals from an environmentally hazardous object into groundwater in two cases: 1) during normal operation; 2) in an emergency situation. Additionally, the article uncovers the pros and cons of both the deterministic and stochastic approaches to the simulation of contaminant diffusion and demonstrates the results of computations for groundwater pollution probabilities via the stochastic approach. The significance of computerized simulation applications in solving environmental problems in practical terms is that computer simulation is the most effective tool to assess the risks of environmental pollution, to control and manage the factors influencing them, and to facilitate the process of making managerial decisions for many other problems in the oil and gas industry.